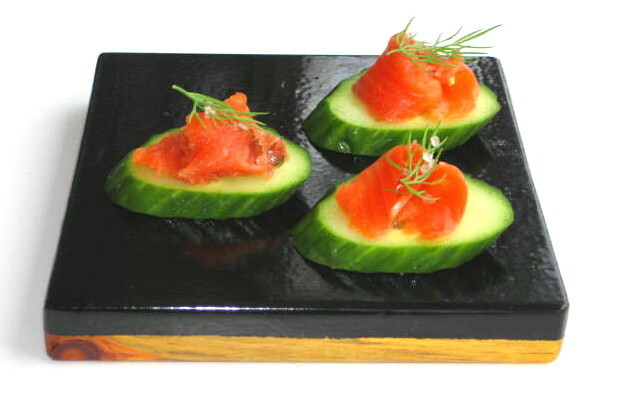 Last week I bought whole side of wild Pacific Sockeye salmon and decided to make gravlax for New Year snacks. I was surprised how this salmon differs from farmed Atlantic salmon in color, taste and texture. 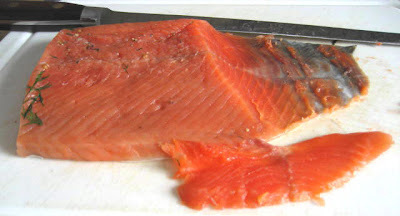 For cooking I prefer the Atlantic salmon but for Gravlax I like the Pacific better. I don’t think that it has even half of the oil that farmed salmon has and the color is deep rich red versus pink-red of Atlantic. Process for curing is exactly the same as in my Gravlax blog. Notice the deep red color. I just trimmed the pictures but the color wasn’t modified. So simple and so good! I love it!